DANGEROUS Geelong midfielder Steve Johnson remains firmly in contention to play North Melbourne on Friday night. But the Cats were yesterday forced to rule out ruckman Hamish McIntosh from the cut-throat semi-final with a knee injury. It will mean former steeplechaser Mark Blicavs will become the Cats' No.1 big man against in-form Roo Todd Goldstein, who was one of his side's best in the win over Essendon, registering 39 hitouts. Blicavs though was impressive in the loss to Hawthorn, using his athleticism to gather 20 disposals, along with 14 hitouts as backup to McIntosh. 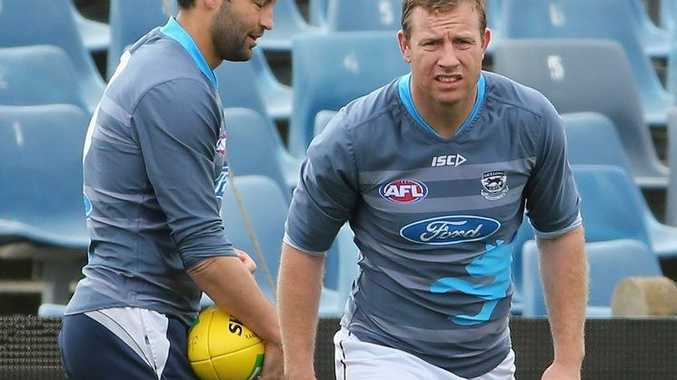 "We're hopeful that Hamish can go through a rehab plan over the next week and a half to get himself in a position, if we're good enough to win Friday night, to play the following week," Cats coach Chris Scott said yesterday. "We've got a few options with Josh Walker coming into the team ... but we've got some other more left-field options that we're considering as well. Tom Hawkins has done a little bit in the past, anyone over 193cm is a candidate." Johnson has been battling a foot injury, but Scott said "our medical staff and Steve himself are happy with the way he's recovered from the game". McIntosh's place in the team is expected be taken by forward Mitch Brown, while the hard-running Allen Christensen is also a chance to return after missing two weeks with a back injury. FREMANTLE coach Ross Lyon confirmed on Monday night goalsneak Hayden Ballantyne would miss Saturday night's semi-final with Port Adelaide with a broken jaw.